The PSNI chief constable and Sinn Féin president have held a "constructive" meeting in the US. George Hamilton and Mary Lou McDonald met on Thursday in Washington DC for what the PSNI described as a "forthright discussion on policing". Sinn Féin said the meeting was "frank and constructive", according to RTÉ. 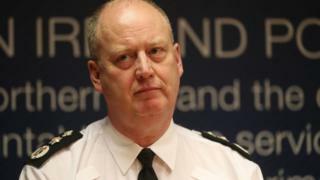 Mr Hamilton criticised Ms McDonald recently when she said she could not think of any current PSNI officer who should replace him when he retires. Ms McDonald made the comments in February about the chief constable recruitment process following a meeting with senior officers to discuss the controversy over Police Ombudsman legacy files. The police chief called the remarks inaccurate and "an act of poor leadership". Following Thursday's US meeting, a PSNI spokesperson said: "The PSNI will always seek to facilitate meetings with political leaders. "Yesterday's meeting with the Sinn Féin leader provided an opportunity for a constructive and forthright discussion on policing." Speaking to RTÉ, a Sinn Féin spokesman said Ms McDonald raised the issue of the failure of the PSNI to disclose information about historical killings to Northern Ireland's Police Ombudsman. "It was a frank meeting but it was a constructive meeting as well," the spokesman said. "The big issue, and where there is agreement here, is that we need to remove legacy policing from contemporary policing."